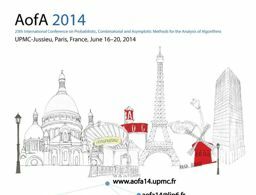 The 25th International Conference on Probabilistic, Combinatorial and Asymptotic Methods for the Analysis of Algorithms, AofA’14, will be held in Paris-Jussieu, June 16–20 2014. It aims at studying discrete objects that appear as data structures or algorithms (including graphs, networks etc.) by mathematical methods, in particular by probabilistic, combinatorial and asymptotic methods.